Overall, this album has a lot of energy. 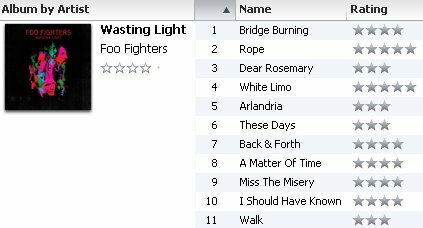 Other than a lot of unique chord progressions in most of the songs, it doesn’t really distinguish itself from any other Foo album. I’m okay with that, though, as they set the bar high with all of their releases. I usually don’t listen to lyrics very closely until I’ve heard an album several times – this review continues that trend. Finally, I thought I’d mention that Bridge Burning and I Should Have Known come close to a five. 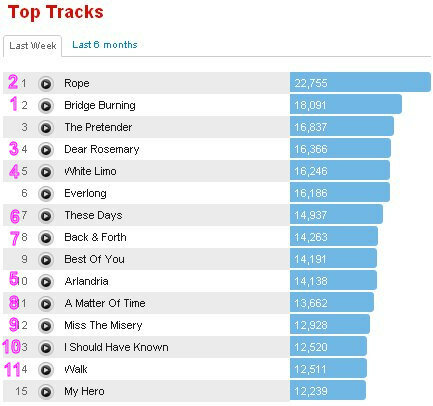 I’m not sure how often Last.fm updates their stats, but here’s a screenshot of the latest top Foo tracks (I’ve added track numbers to the songs from this new album). Other than Dear Rosemary, These Days, and I Should Have Known, I generally concur with these listening habits from the masses.